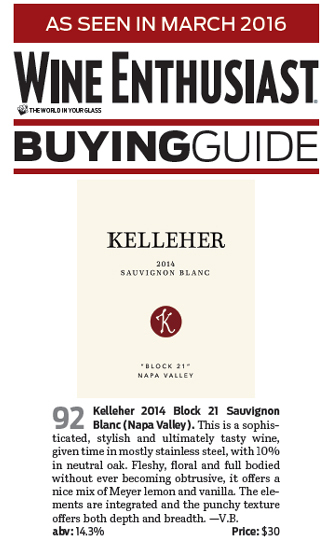 The 2014 Kelleher "Block 21" Sauvignon Blanc is sold out. 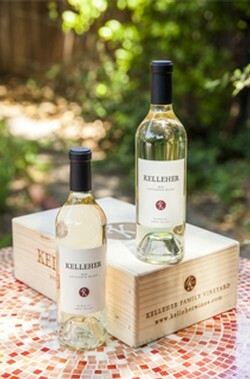 Our 2014 Kelleher "Block 21" Sauvignon Blanc is a full bodied, luscious, fruit driven wine that treats you to balanced acid and a lingering finish. The fruit for our Sauvignon Blanc is grown in a dry farmed, organic vineyard in St. Helena. Aging was done in 90% stainless steel barrels and 10% neutral French oak and we find that this combination really enhances the fruit from this special vineyard. The aromas are dominated by tropical notes, as well as a hint of stone fruit and melon. The fruit forwardness is enriched by the depth that battonage imparts on the wine. The nose is bright with tropical fruits, while the pallet is rich but focused by the bright acidity. The 2014 vintage of our Kelleher "Block 21" Sauvignon Blanc is crisp yet has a full bodied essence-especially in the finish. Aging 4 months in 90% Stainless Steel and 10% used French Oak. Tasting Notes The nose is bright with tropical fruits, while the pallet is rich but focused by the bright acidity. The wine has three main attributes, fruit, richness and crisp acidity! Vineyard Notes The fruit for this wine is selected from one of the most regarded Sauvignon Blanc vineyards in Napa Valley, located just south of St.Helena. The vineyard is dry farmed and planted on 5C root-stalk and clone 1 Sauvignon Blanc.